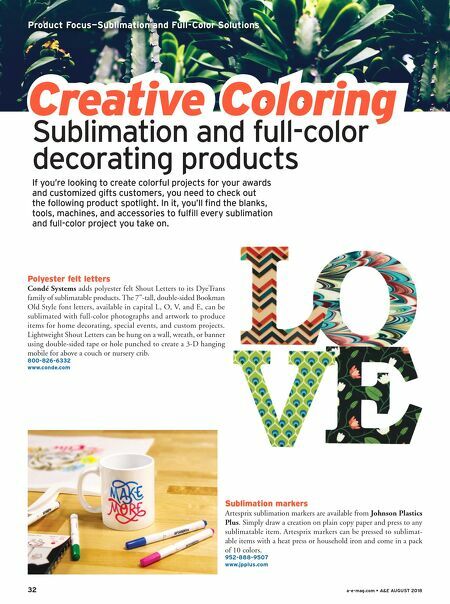 32 a-e-mag.com • A&E AUGUST 2018 Creative Coloring Polyester felt letters Condé Systems adds polyester felt Shout Letters to its DyeTrans family of sublimatable products. The 7"-tall, double-sided Bookman Old Style font letters, available in capital L, O, V, and E, can be sublimated with full-color photographs and artwork to produce items for home decorating, special events, and custom projects. Lightweight Shout Letters can be hung on a wall, wreath, or banner using double-sided tape or hole punched to create a 3-D hanging mobile for above a couch or nursery crib. 800-826-6332 www.conde.com Product Focus—Sublimation and Full-Color Solutions Sublimation markers Artesprix sublimation markers are available from Johnson Plastics Plus. Simply draw a creation on plain copy paper and press to any sublimatable item. Artesprix markers can be pressed to sublimat- able items with a heat press or household iron and come in a pack of 10 colors. 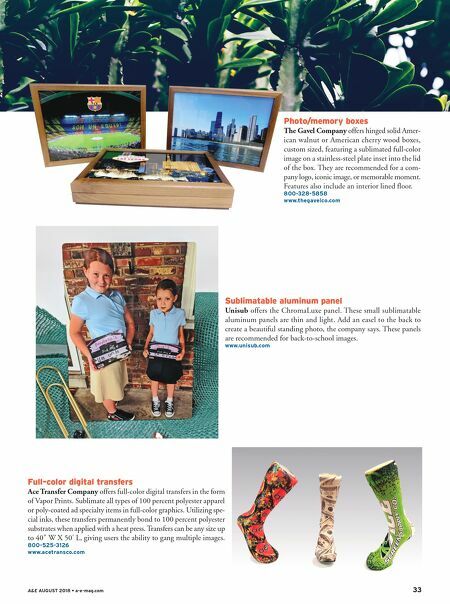 952-888-9507 www.jpplus.com Creative Coloring Sublimation and full-color decorating products If you're looking to create colorful projects for your awards and customized gifts customers, you need to check out the following product spotlight. In it, you'll find the blanks, tools, machines, and accessories to fulfill every sublimation and full-color project you take on.